Composer Nick Proch, whose work ranges from film scores to marching band arrangements, has some very specific ideas when it comes to rock and metal. Specifically, he feels it should be played by orchestras with full string, woodwind, and brass sections. 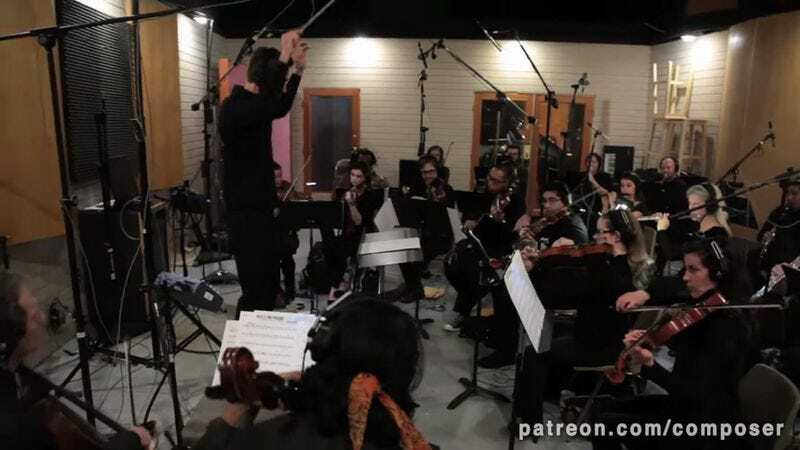 Last year, Proch masterminded a conceptual, Kickstarter-funded album called Tantamount, featuring orchestral covers of songs by Rage Against The Machine, Muse, and My Chemical Romance. And now, he has progressed to a cover of RATM’s 1996 politically charged classic “Bulls On Parade” performed by a 35-piece ensemble, including trombones, bassoons, and even French horns. And how does that sound, exactly? Sort of like the main title from a 1970s action movie about the angriest, loudest spy ever, or perhaps the theme song of a TV cop who really doesn’t like playing by the rules. Of course, the lyrics about rallying around the flag with a pocket full of shells are missing, but the song’s underlying sense of indignation comes through nevertheless. This is a track which should appeal to jean-jacketed stoners and goody-goody band geeks alike. These kinds of sonic experiments do not exactly grow on trees, however, so Proch has the standard Patreon page where he asks for donations to cover the costs of musicians, studio time, recording engineers, etc. “Orchestral versions of songs you know” is the campaign’s simple, to-the-point slogan. Past Proch projects along these lines include a high-toned version of Macklemore and Ryan Lewis’s “Thrift Shop.” “I would love,” he writes, “to continue recording with the same size orchestra I’ve been fortunate to record with to this point.” Possible future subjects for the Nick Proch treatment include “Schism” by Tool. The arranger’s current goal is $2,000. “It’ll be a tough road to reach,” he concedes, “but it will be worth the journey to be able to create new music.” Well, new-ish, anyway.